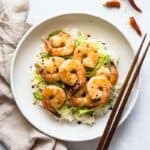 This mouth-watering honey chili garlic shrimp takes only 15 minutes to make! 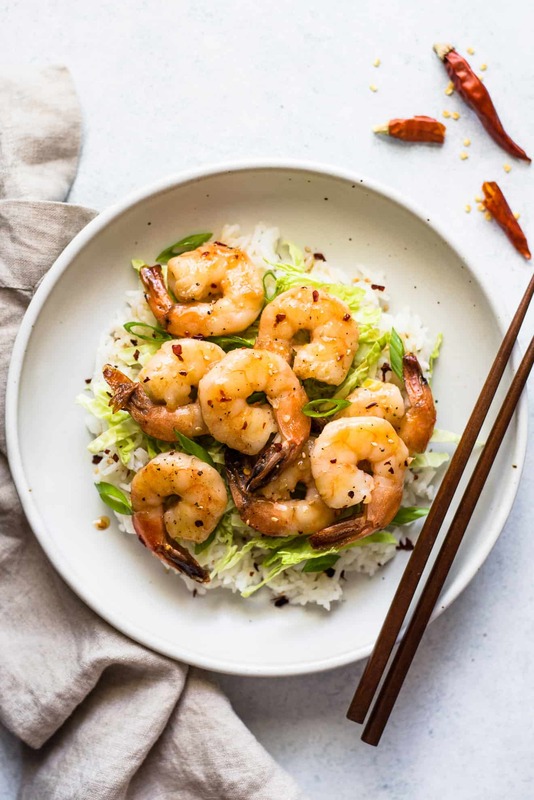 The sweet and spicy flavors of my honey chili sauce are perfect with the shrimp. It’s great with a side of rice and your favorite vegetables. I threw together this honey chili garlic shrimp one night after a cooking class at the library. I had already worked hard in the kitchen that day, and I couldn’t muster up any energy to prepare a big meal. I happened to have some peeled shrimp in my fridge and a jar of my honey chili sauce left over from my class. I tossed the shrimp with some minced garlic and a generous pinch of kosher salt, fried them up and drizzled my honey chili sauce on top. I was pleasantly surprised by how the dish, which took just 15 minutes to prepare, tasted so wonderful! Don’t you love it when that happens? Preparing the shrimp overnight: For one of my test batches, I tossed the shrimp with minced garlic and salt and let everything sit in the refrigerator overnight. I must say, the shrimp tasted even better! 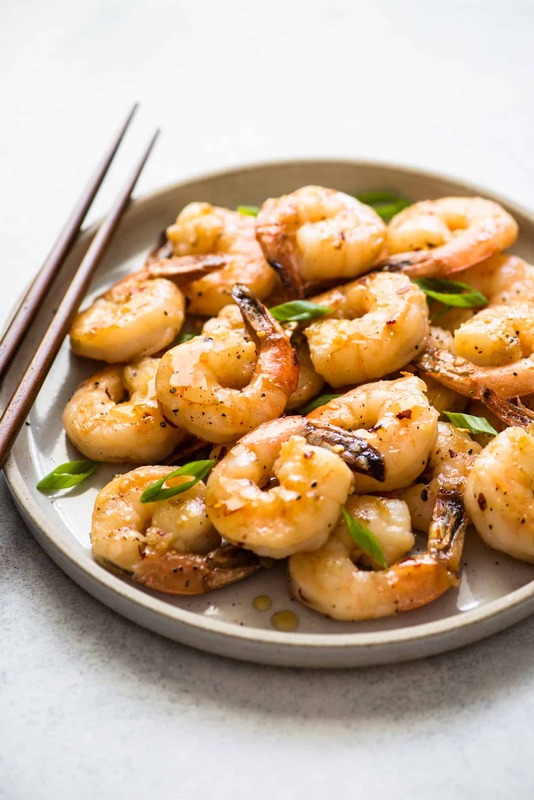 If you have just 5 or 10 minutes the day before to prepare the shrimp, do it! Honey chili sauce: Of course, you can use any honey chili or sweet chili sauce for this recipe, but you should definitely try my honey chili sauce, even if it’s just one time. 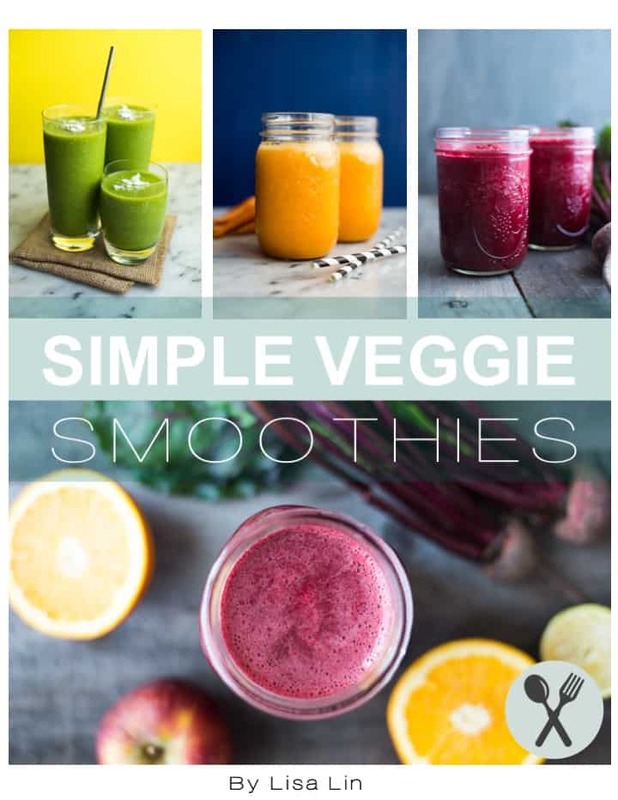 It’s made with just 6 ingredients, all of which your probably already have in your kitchen! Large non-stick pan: One of my favorite pans for pan-frying tofu and shrimp. I’ve spent so much money on inexpensive non-stick pans, and they fall apart in a few years. This All-Clad pan feels very sturdy (no plastic parts), and it comes with a lid. Honey chili sauce: My recipe! If you are in a time pinch, you can also use store-bought sweet chili sauce. Grama’s sweet chili sauce is one that I would actually but. It’s all-natural (no msg), and it tastes great! If you are pressed for time, serve this dish with some plain rice and steamed vegetables. Drizzle extra honey chili sauce over the rice to give it more flavor. If you have some more time to cook, serve the shrimp with my pineapple fried rice, jollof rice or coconut lime butternut squash fried rice (<— paleo)! In a large bowl, combine the shrimp with the minced garlic and salt. Heat a large pan with the olive oil over medium-high heat. Once the pan is hot, add the shrimp. Cook each side for about 2 to 3 minutes, until the shrimp is orange and you can no longer see any raw, gray spots. 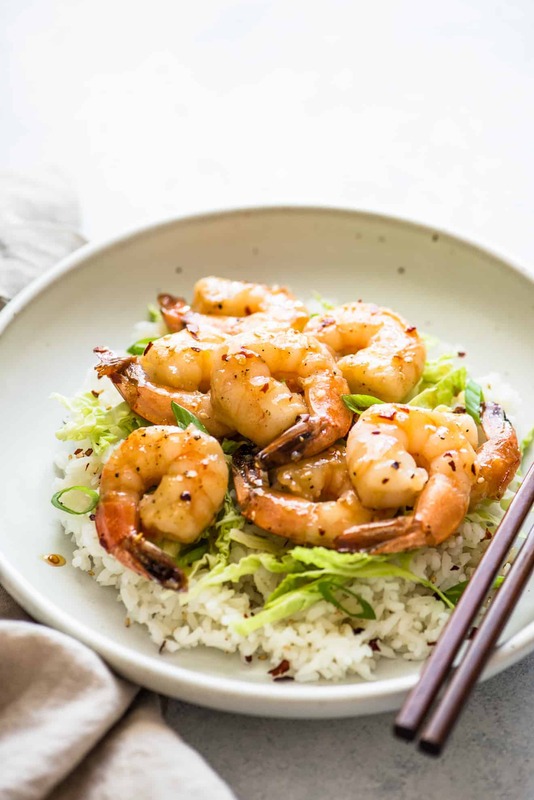 Drizzle the honey chili sauce over the shrimp and toss to coat with the sauce. Season the shrimp with salt and pepper to taste. Serve immediately. 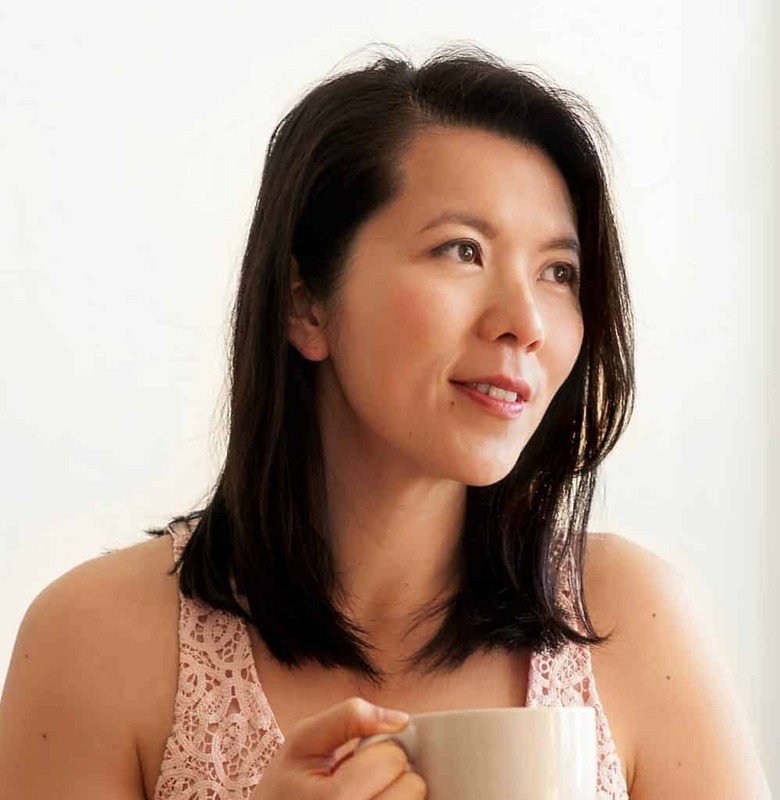 I love the simplicity of this recipe, Lisa–my kind of meal for sure!